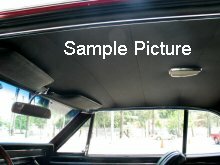 On the early 1966 design the rear of the headliner continues to package tray area. It has a small sail panel. The late 1966 has a full sail panel and is the more common vehicle.